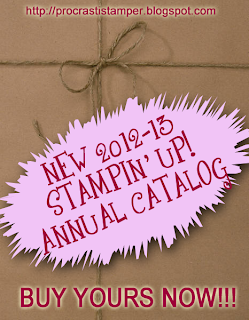 Gizmo is also totally stoked about the debut of the NEW 2012-2013 Stampin' Up! Annual Catalog, which you will be able to view online tomorrow, and order from, after 12pm MT. Gizmo also wants you to check out my ONLINE STORE RIGHT NOW to make sure you don't miss out on getting what you want from the Retiring Products section, before it's gone! Be sure you finalize your order before 11:50pm MT tonight! Sorry I've been MIA lately, my youngest was finishing up her senior year of high school, and we are still working on graduation celebration activities! 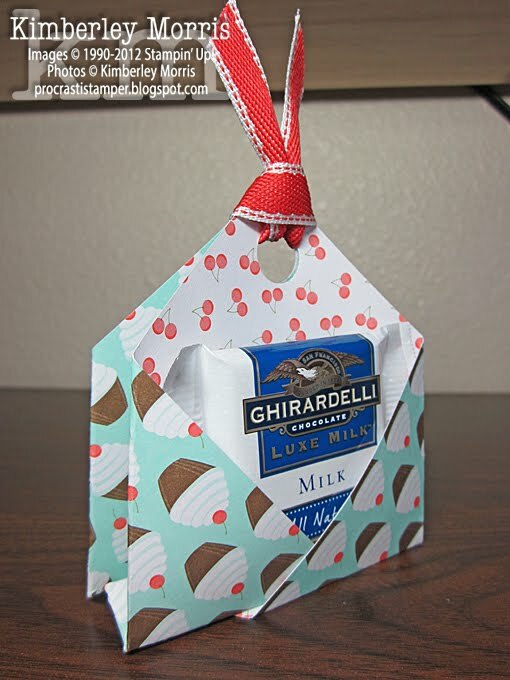 I just made the cutest little treat holder...of course, I think they're all cute...but this one (like all my favorites) involves chocolate! 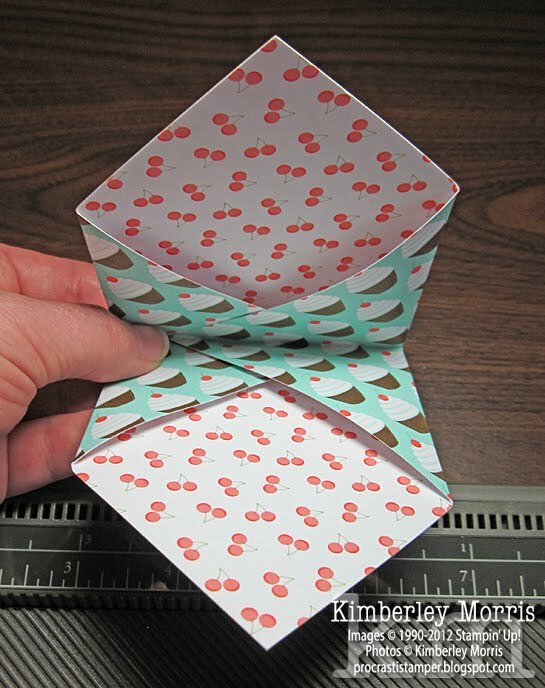 It's super simple to make, and the dimensions are perfect for using full sheets of paper. 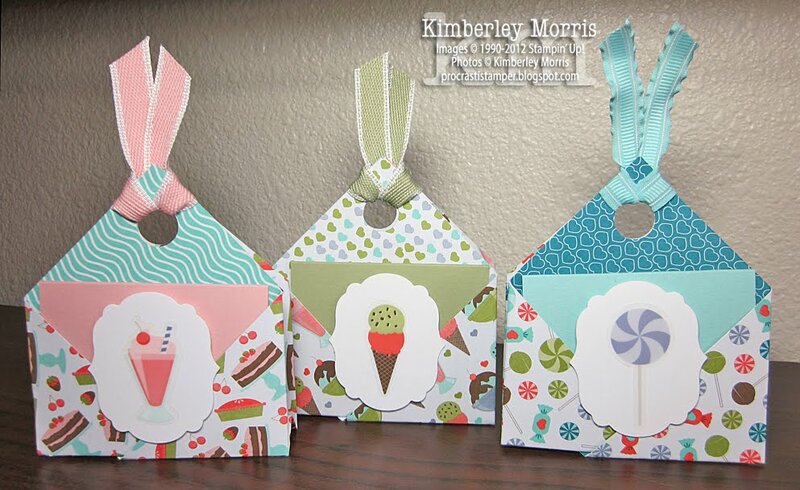 My samples use the Sweet Shop Designer Series Paper (DSP) from the Occasions Mini Catalog, and some coordinating stickers, which are no longer available. [But I bet they'll show up on the Clearance Rack so keep your eyes peeled!] 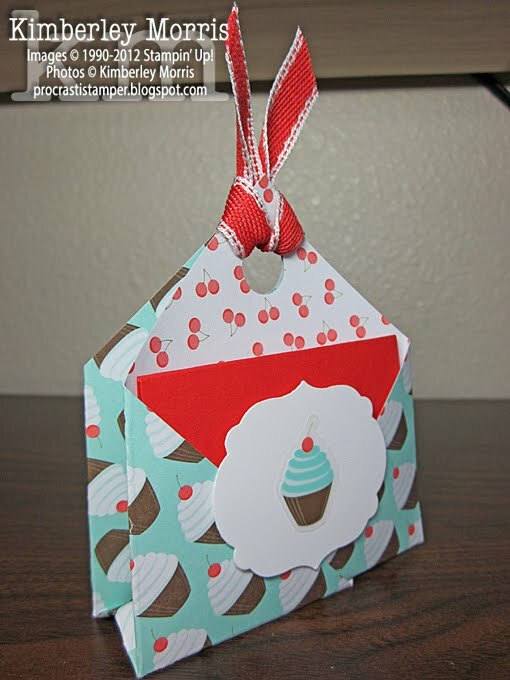 You can use any DSP and coordinating card stock you want--I chose mine because I wanted to use it up. Remember: Click on any picture to see it full-size. You're going to need some 12x12 paper, and our Designer Series Paper is perfect, with coordinating double-sided patterns. Each sheet will yield 4 of these holders. In our Designer Series Paper packages, you usually get 2 sheets of each pattern, so that is 8 holders of the same pattern. 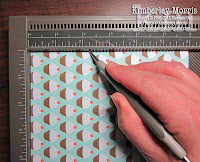 For the card inside each, you use 1/8 of a sheet of 8-1/2"x11" card stock, so you can cleanly use a whole sheet of a coordinating color for your 8 holders of the same pattern! Cut each 12x12 sheet down to four 6"x6" sheets. 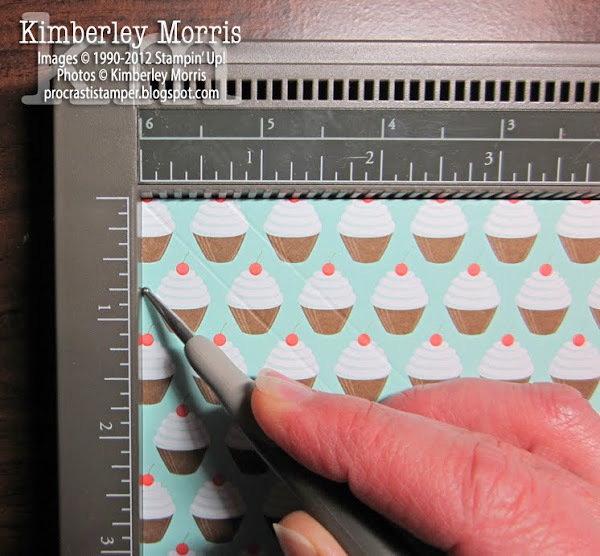 Using the Diagonal Plate on the Simply Scored Tool, score each 6x6 sheet in half diagonally from tip to tip. 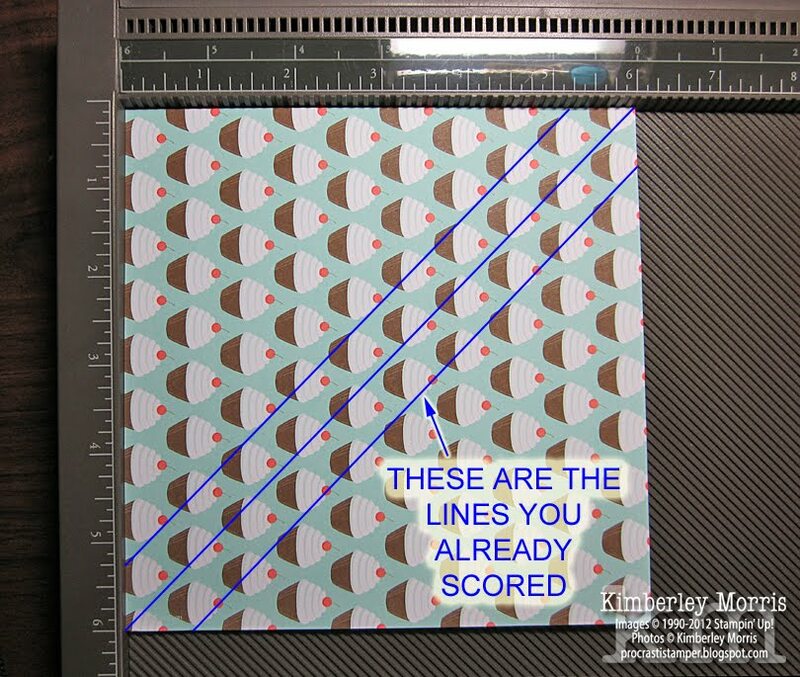 This means you start at zero on the ruler and score diagonally all the way across the sheet. Then, you will score at 3/4" on each side of that middle score line. If you look at my photos below, you'll see that I use the ruler across the top, as well as the ruler down the left side, without lifting my paper. This is NOT how the Simply Scored Tool was intended to be used, because the left side ruler does not have the handy channels going down it for your scoring tool to slide into. 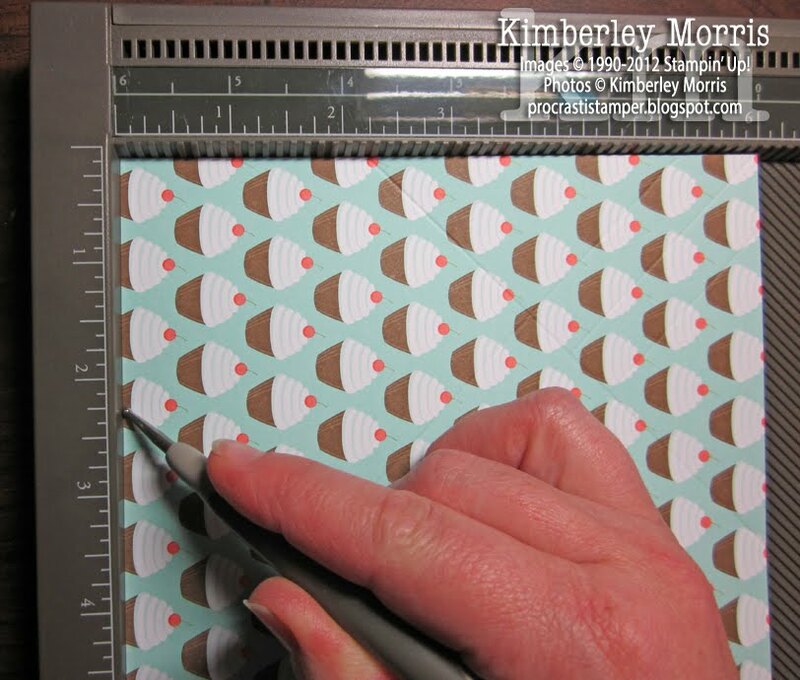 Unless and until you are comfortable doing this, you will want to turn your paper turn your paper 180 degrees to get that 3/4" mark on the other side of the center line. Okay, then you will want to turn your paper 1/4 turn from where you originally had it when you scored the first diagonal. On my paper, the cupcakes were upright when I started. In the picture below, you can see the top of the cupcakes are pointing to the right...because I have turned the paper one quarter turn. Now, score each of the ends at 2-1/4", as shown below. Your 2-1/4" score marks will cross over the lines you already scored. Again, I leave my paper on the board and use both the top ruler and the left side ruler when I score diagonally. 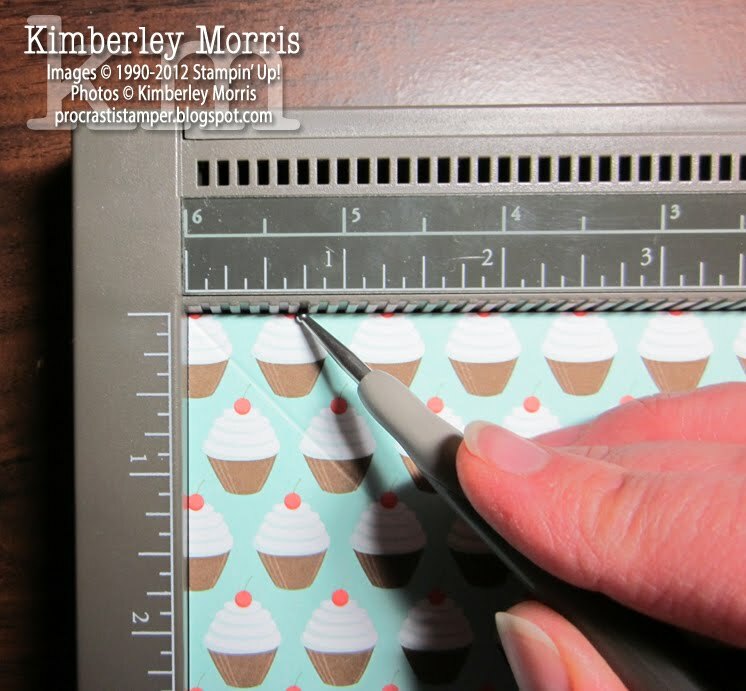 Please use only the top ruler with the channels coming down for your stylus, unless and until you are comfortable enough to use the left ruler. 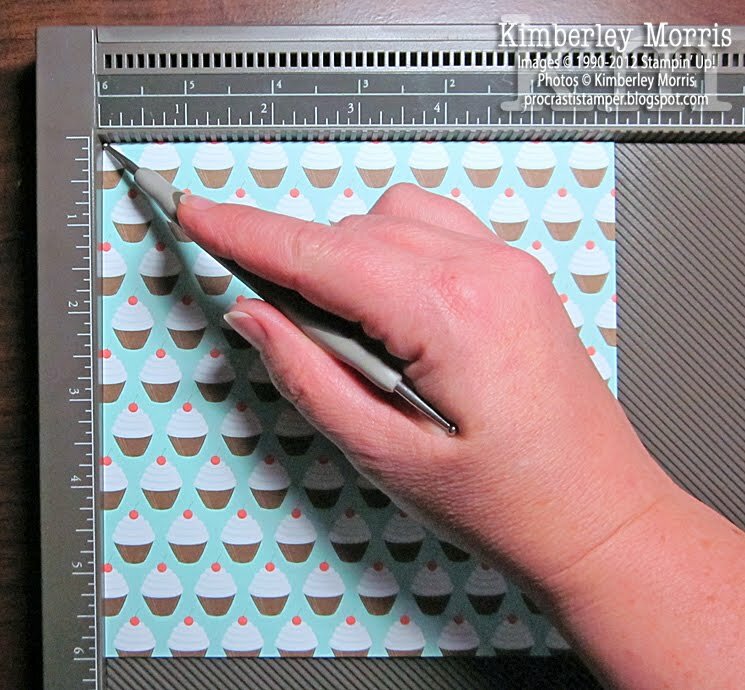 Note that using only the top ruler means you will have to turn your paper 180 degrees for the score on the opposite end. From here is it cake (or cupcakes, as the case may be). 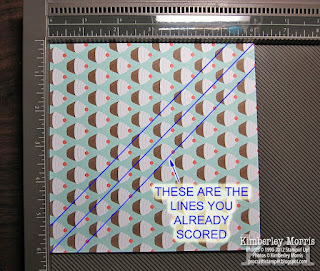 Fold each of the 2-1/4" sides in on the score lines, toward the center, as shown below. 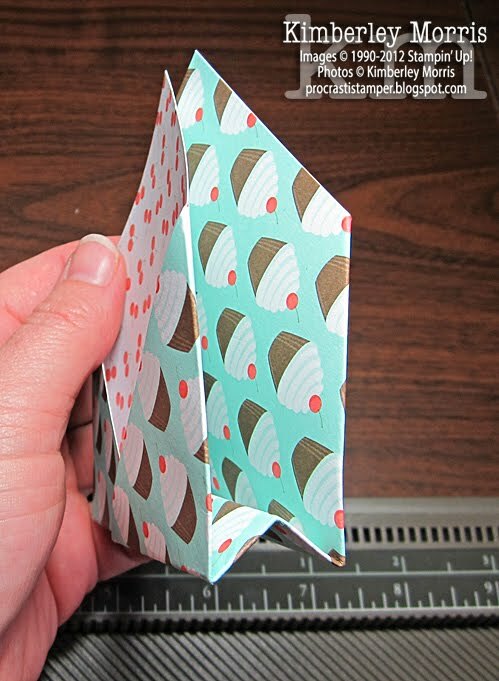 Fold this resulting piece in half on the center score line by bringing the criss-crossed "pockets" in towards each other, as shown below. Then, fold each of the "pockets" back on its respective 3/4" score line, as shown below, so that the pointy tips of your holder meet. 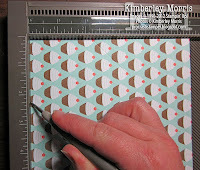 Crease firmly, and hold tips together while you punch a 1/2" Circle Punch near the top of the tips. 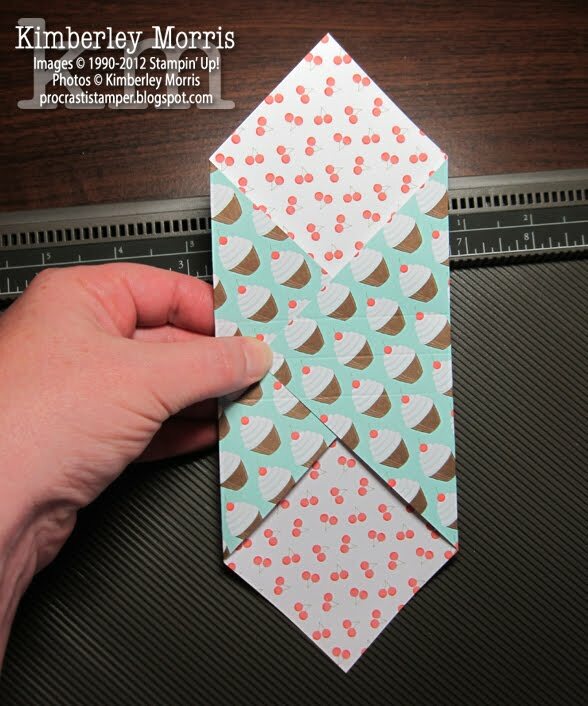 Finish it by looping a 6" strip of coordinating Ribbon through the holes and pulling tight to hold tips together. A Ghirardelli Chocolate Square™ fits in one pocket, and then I put a little card in the other pocket on the other side. To make the card, simply cut a sheet of 8-1/2x11 card stock into 8 pieces (2-3/4x4-1/4). Score each card at 2-1/8". I used the smallest of the Labels Collection Framelits Dies for the front layer of each card. Some of them were turned one direction on the card front (as with the sample at the top of this post), others were turned the other way, just depending on the image I wanted on each. 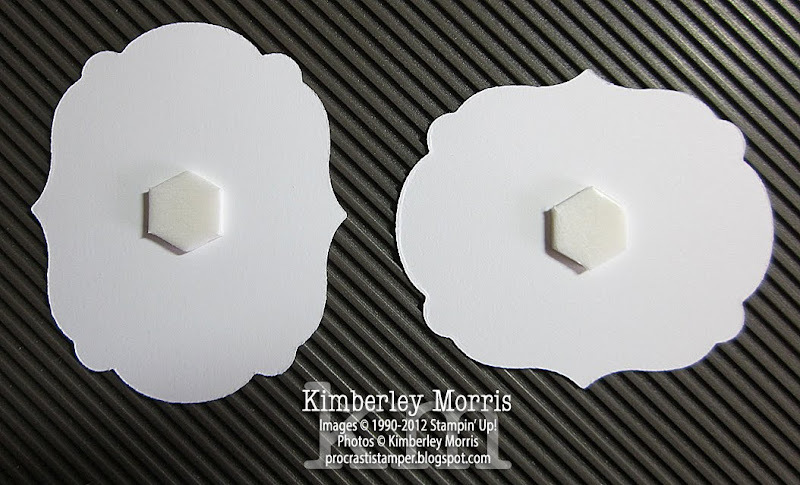 This is important: each of these die cuts is adhered to the center of each card front with only ONE Stampin' Dimensional, right smack in the center back. To get your card to fit snug down in the pocket, make sure the points on your dimensional are pointing down into the 'V' of the criss-cross in the holder pocket. 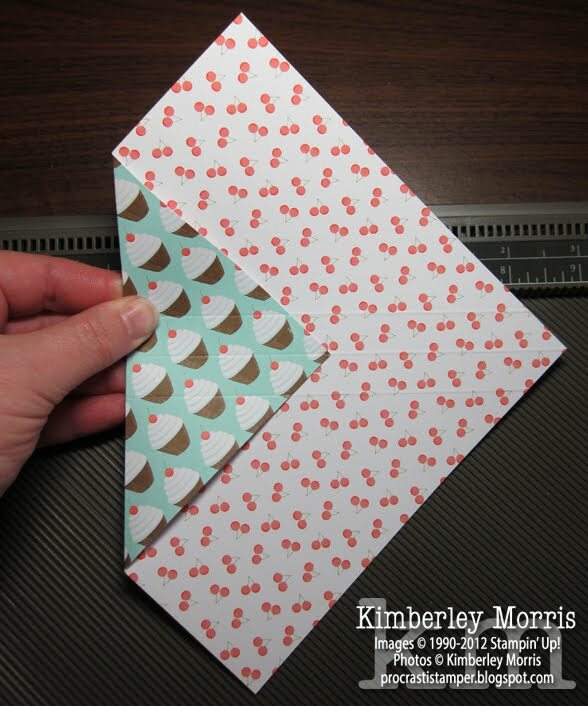 This allows you to tuck the card in the pocket, with the criss-cross of the pocket sliding up under the label. So when you pull the card out, the label is actually on the card front, not on the holder--fun, huh? See the pictures below for orientation of dimensionals in accordance with orientation of die cut. The dimensional placement on the left is for a tall-skinny orientation like the 3 samples pictured above. The dimensional placement on the right is for a short-wide orientation like the sample at the top of this post. That's it, now get to it! These make great party favors (I'm using mine for my daughter's graduation party), but they are also wonderful little thank you cards with a treat in them! If your kids aren't out of school yet, they could easily help you make a handful of these for teachers and administrative staff. If they are having an end of year party with their classmates, they could put their photo on front of the card (cut out with the framelit), and print their name & phone number/email address out on a sheet of return address labels, and put a label inside each card so their friends can keep in touch over the summer. Even though the new Firm Foam ink pads that we'll have, include a nifty little color name sticker, the print is not black, nor is it bold enough for me. So, I use the included sticker across the top of the front, PLUS I add my black and bold stickers under that...in the same place as pictured above. I print out the labels, then cover them (a sticker maker provides a great thin laminate covering), and then punch each color name out with the Word Window Punch. Then peel and stick the label onto the end of the ink pad...and because of the laminate, you can just wipe the label clean if you smear ink on it! The color names are big and bold so you can easily see them across the table. There are also some color collection names at the end of the sheet of labels, if you'd like to use them. 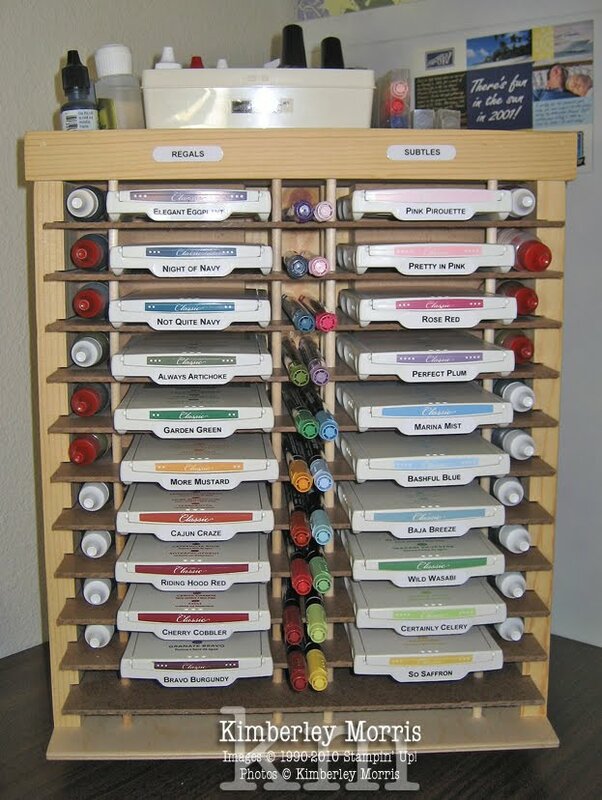 You may find it handy to print out a second sheet of the color names and use those for the file tabs, containers, or shelves of your card stock. While I cannot sell you the ink pad rack I have, Stampin' Up! 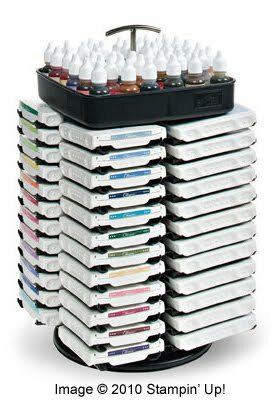 does offer one that rotates 360 degrees like mine, with four columns, each with 12 spaces for ink pads (to hold 48 total), called the Color Caddy. Unlike my behemoth, the Color Caddy only requires a 10" footprint to spin freely, and is about 16-1/2" tall. 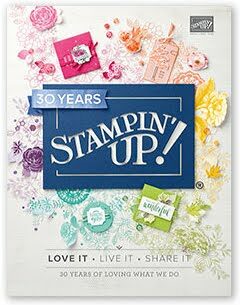 Get Your 2012-13 Stampin' Up! Annual Catalog! 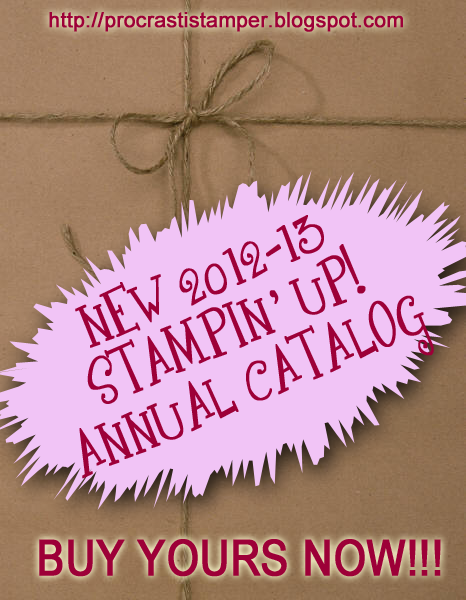 Wooo hoooooo, GET YOUR NEW 2012-2013 STAMPIN' UP! ANNUAL CATALOG TODAY! STANDARD $5 - This is a standard bulk mail delivery, which can take up to a few weeks to reach you, depending on service in your area. There is no tracking available with this service. PREMIUM $8.50 - This is a faster delivery service, and should reach you within 4-6 days of your payment, or May 14th, whichever is later. Tracking IS available with this option. redeemable with your first order of $35 or more, through May 31st, 2013. Please note that this is a PREORDER until May 14th, and when you click the Buy Now button below, you agree to having your card charged immediately, knowing that mailing will not start until May 14th. The sooner you preorder, the earlier your name is entered into the queue. After May 14th, your order will be entered within the next 24 hours after your payment is received.